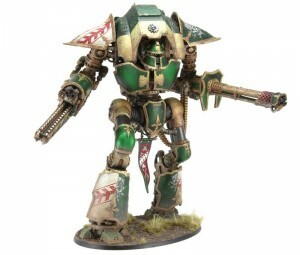 Forge World has a new Knight available over in their webshop. This one's the Cerastus Knight Archon. The devastation wrought by Knights-Acheron is terrifying to behold. Armed with a fearsome reaper chainfist, twin-linked heavy bolters and an Acheron pattern flame cannon, they are employed as weapons of extermination and to inspire fear in their foes. Nothing will sway their attack until the enemy is utterly crushed, never to rise again from the flame-scoured ruins of their strongholds. The Cerastus Knight-Acheron can be taken as part of a Horus Heresy Mechanicum army, a Codex: Imperial Knights army and as a Lords of War choice for an Imperial faction army in games of Warhammer 40,000. Designed by Daren Parrwood, the Cerastus Knight-Acheron is a complete resin kit, and is available to order now for immediate despatch.